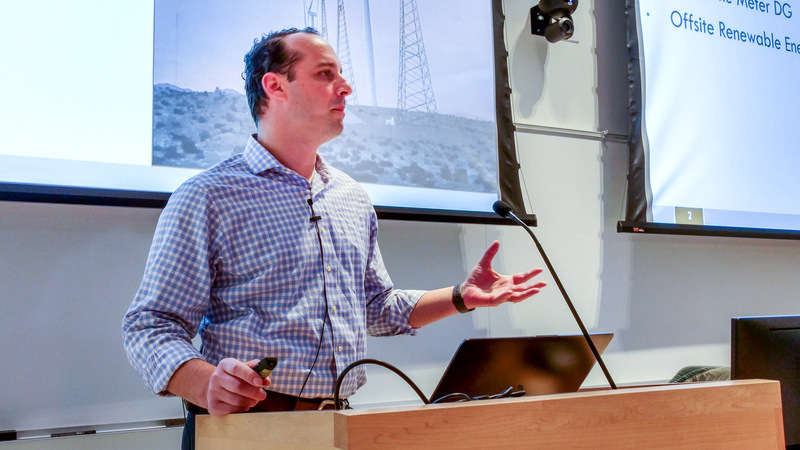 In the third talk of our fall lecture series, BCT alumnus Zac Bloom, spoke about Designing Energy Procurement Strategies. Zac, who is Director of Sustainability and Renewables at Competitive Energy Systems (CES), was intricately involved in many energy projects including the recently installed UMass 5 MW solar array. In his talk, he gave us a broad and eloquent overview of the many factors that influence energy purchasing and systems selection. Mr. Bloom originally joined Competitive Energy Systems (CES) in 2012 as a Business Development and Account Manager and was soon promoted to Director of Sustainability & Renewables. Now CES’s Vice President, Head of Renewables & Sustainability, Mr. Bloom primarily consults with universities and large commercial customers on energy procurement strategies, budgeting, sustainability, energy benchmarking and CES’s proprietary Utility Tracker. Prior to joining CES, at UMass Amherst, Mr. Bloom focused his studies on energy benchmarking and data visualizations for large data sets associated with building’s resource consumption profiles.